How do Public Health and Medicine Differ? Public Health complements medical care . . . But how do they differ? Let’s take the example of diabetes. Medical care for diabetes is delivered in hospitals and clinics, and involves prescribing diabetes medications and treating its complications (eye disease, heart attacks, or kidney disease, for example). The Public Health view, on the other hand, asks the question, "Where did these diabetes patients come from, and why did they get diabetes in the first place?" The answer is that people with diabetes come from a community. Diabetes results from what is happening in the community: homes, work-places, and leisure spaces. Public Health thinks about diabetes at its source: the things in the community that are leading to people becoming overweight. This is an increasing problem in adults in Kuwait, but is especially a concern among the children. Public Health would approach this problem first by investigating why so many young children are becoming obese in Kuwait these days. There are many reasons, but one could be that parents or grandparents may view a heavier weight as healthy. Another reason could be that some people may view exercise as difficult, unappealing, not easily available, or not needed. Research is needed to identify and find ways to decrease these “causes of the causes” of diabetes. Public Health not only identifies the roots of the problem, but then designs programs and interventions to address those issues. It is the responsibility of Public Health to intervene in the community to reduce such risky behaviors for disease. 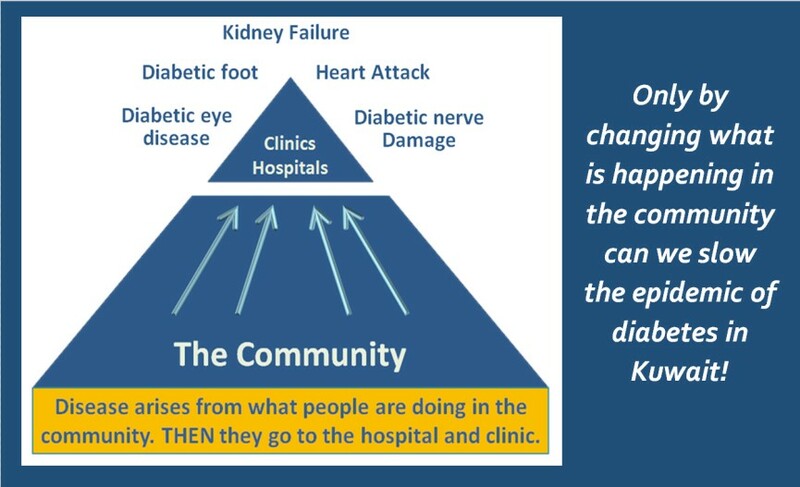 It is only by changing what is happening in the community that can we slow the epidemic of diabetes in Kuwait!